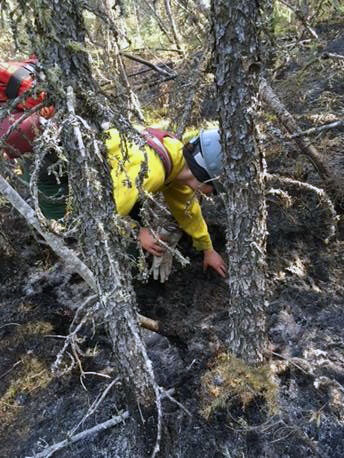 Despite hotter, drier conditions, there was not a significant increase in fire activity Wednesday on two wildfires burning approximately 100 miles west of Fairbanks and 8 miles south of Manley Hot Springs. There was no increase in size reported on either the Zitziana River Fire (#133) or Mooseheart Fire (#204). The Zitziana River Fire remains at an estimated 34,380 acres and the Mooseheart Fire remains at an estimated 52,700 aces. Both fires were started by lightning more than two weeks ago. The 145 personnel working on the two fires continued mop-up and point protection operations on Wednesday, repeating the same strategy employed for the last several days to protect cabins and homes around Kindamina and Mooseheart lakes, as well as Native allotments along the Tanana River. Fire managers were anticipating an increase in fire activity as a result of hotter, drier conditions with temperatures climbing into the high 70s and low 80s and relative humidities dropping into the 20 percent range. But the expected fire behavior didn’t materialize, allowing firefighters to maintain their focus on mopping up and building line. Firefighters at Kindamina Lake continued mopping up around structures and improving the direct line built from Kindamina Lake to a small lake to the west. Two crews continued making good progress on construction of an indirect line west from Kindamina Lake to the south end of a small lake to the west. Smokejumpers continued formalizing a plan to protect structures at Mooseheart Lake if necessary and also worked on constructing a helicopter landing zone. Smokejumpers and the Midnight Sun Hotshot crew, meanwhile, continued point protection work on three Native allotments along the Tanana River, the closest of which is 1.5 miles from the fire. The two fires are being managed by a Type 3 organization from the BLM Alaska Fire Service that is based in Manley Hot Springs. Both fires are burning in a limited fire management option area that allows fires to function in their normal ecological role while allowing for protection of structures and Native allotments that may be are threatened. A temporary flight restriction (TFR) remains in place over both fires to provide a safe flying environment for aircraft working to support firefighters on the ground. Pilots should go to http://tfr.faa.gov/save_pages/detail_8_6507.html to check NoTAMS before flying anywhere in the area. For more information, go to akfireinfo.com or call the fire information office at the Alaska Interagency Coordination Center at (907) 356-5511.